On March 9, the Mahasamadhi anniversary of Swami Sri Yukteswarji is commemorated through meditation and satsanga programmes. Read more about Swami Sri Yukteswarji here. The programmes at YSS Noida Ashram and Gurugram Kendra are given below. 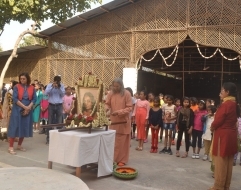 On the evening of March 9, 2019, the Mahasamadhi Divas of Swami Sri Yukteswar Giri was commemorated at YSS Noida Ashram with a satsanga and pushpanjali. 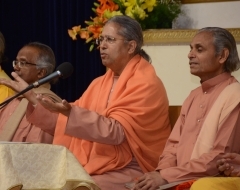 The programme was conducted by Brahmachari Sheelananda. In his satsanga, he said that Swami Sri Yukteswarji had been able to transform our Gurudeva Sri Sri Paramahansa Yogananda into his likeness. It was on this day, March 9 that he gave him the charge and left for higher realms. 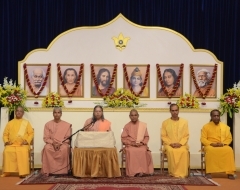 He emphasized on a particular aspect about the nature of Swami Sri Yukteswarji - humility. He quoted various instances from the best-selling spiritual classic Autobiography of a Yogi authored by Paramahansa Yoganandaji where this divine quality of Sri Yukteswarji has been spoken of. He said that we must also develop this quality of humility if we want to advance on the spiritual path. The programme was followed by pushpanjali where the devotees attending the programme offered floral tributes at the altar. On the occasion of the Mahasamadhi Divas of Swami Sri Yukteswarji, devotees led the group meditation and pushpanjali programme on the morning of March 9, at YSS Gurugram Kendra. It was attended by about 60 devotees. On the following day, March 10, the Mahasamadhi anniversaries of Gurudeva as well as Swami Sri Yukteswarji were commemorated through a satsanga, group meditation and pushpanjali at YSS Gurugram Kendra. Brahmachari Sheelananda gave the satsanga on this occasion. 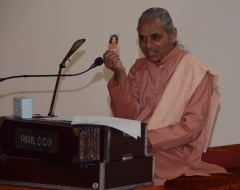 In the satsanga, he inspired devotees by reminding them of Guruji's words that in seeking God, the devotee's efforts is 25 per cent, the Guru’s efforts is 25 per cent, and the remaining 50 per cent is the grace of God. When devotees put 100 per cent effort of this 25 per cent share, they will automatically draw the remaining 25 per cent of Guru’s blessings and 50 per cent of God’s grace. The programme was followed by Guru Langar and Narayan Seva. Around 150 devotees and many Sunday school children were present on this occasion. Nearly 150 people from the underprivileged section of society were served food packets near the Kendra premises during the Narayan Seva. To view images from the programmes, click here.